Posted in Empower Sales Conversations, Improve New Product Launch, Increase B2B Sales, Presales, Product Management, Product Marketing, Sales, Why LeveragePoint? For complex B2B products, specialization and customization are two unstoppable waves in business strategy and organization. Sales teams increasingly include specialist presales professionals who make it possible to address complex problems and apply complex solutions in customer-facing roles. Customization of solutions is a powerful weapon against commoditization while customization of content is a primary means to connect to customers flooded with information in the digital age. In our last blog, we looked at the relationship between B2B sales product focus and customization. Some sales teams are accountable for single products. More sales teams are diversified, focusing on product and service packages or on selling products or solutions from a multiproduct platform. At the other end of the spectrum is a custom solution focus. Presales roles and titles change across this spectrum as customization increases. With light customization, Product Managers or Business Development representatives get involved. As customization of content increases, presales professional titles often reflect that shift with Subject Matter Experts (SMEs) or Technical Sales understanding and adapting content to customer specifics. As packages and multiproduct solutions are customized, package and solution customization are frequently handled by professionals with a title of Solution Consultant or Sales Engineer. For one-off custom solutions, presales professional titles may include Solution Architect where solution design is central. Specialization and Customization are Expensive. Innovative, customized solutions and content increase revenue and improve pricing, but the cost required to close each new deal naturally gets higher with more specialists included in the sales team. There is greater headcount involved per account. Presales professionals are expensive, often having advanced degrees and/or domain experience. This cost of complexity, specialization and customization puts constant pressure on sales and presales teams to improve their productivity by generating more qualified opportunities, collaborating efficiently and improving close rates. Four Strategic Trends for Sales and Presales Teams. Cost pressure sometimes drive sales and presales layoffs, shifts from outside to inside sales and regular culling of the least productive members of the team. More often it creates a dynamic that drives strategic changes as well. There are four widely observable strategic trends for sales, driven by the need to be more efficient. Each of these trends creates its own set of challenges. 1. Add products to a sales rep’s bag. If reps are becoming more expensive, why not give them more to sell? A simple solution that immediately increases the challenges of sales complexity. 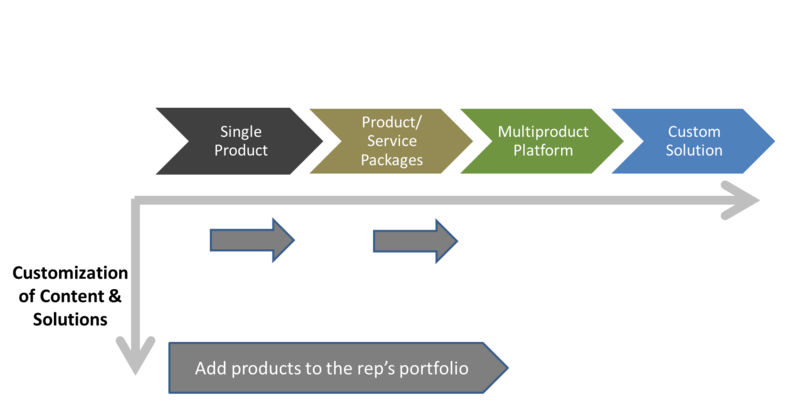 Adding products to a rep’s bag creates both a problem and an opportunity for product managers. Getting sales attention and focus turns into an increasingly difficult job for product managers. Getting sales to understand their products and sell them effectively becomes harder as well. The consequence is that product managers often hit the road themselves to get product attention and to be sure that their product is sold at reasonable standards. Sometimes starting from a purely inside role, the best product managers gradually become important contributors as presales professionals and valuable members of the sales team. The broader sales team expands as a predictable but unintended consequence of expanding sales reps’ product portfolio. One positive outcome is that product managers develop sales skills and get in the habit of obtaining direct customer feedback. By seeking out and accepting pressure roles in customer meetings, product managers learn better, become more agile and actively improve the useful sales content for their products. But as sales begins to rely on (and compete for) the best product managers for critical meetings, that creates bottlenecks in the sales process. We have all seen the very effective product manager who becomes indispensable to the sales process for his or her product. His or her bandwidth is completely overtaken by customer meetings and he or she stops being a functional product manager. The product manager closes lots of deals but no longer looks for scalability from other members of the sales team. Performance bonuses often reinforce this trend when product managers are paid well by pointing to closed deals where product managers are directly involved. Senior management makes the mistake of comparing revenues for a product manager with revenues for an average rep and paying accordingly. The product manager learns to sift through the opportunities to maximize personal customer touches for deals most likely to close. The upshot is that the product manager over-invests time in his or her presales role and underinvests in leverageable product management activities and deliverables. Product content develops anemically and product revenue growth is slower than it should be, despite the high fives being awarded for each deal to the product manager. Incentivizing product managers to balance their energies between presales and true product management is essential. Product managers must learn from their own direct interactions and provide sales with content that will empower sales to have high quality customer conversations without the product manager on the call. A strong widely usable Value Proposition is one of the best pieces of content that a good product manager can produce for these purposes. It moves beyond product features and technical details to focus on the benefits to the customer and what that is worth. If structured clearly and simply, a Value Proposition is an efficient tool for sales call prep, a great approach to qualifying opportunities and a strategic way for product managers to capture what they learn from customer conversations and leverage it. Product managers spend their time more efficiently and sales reps perform better as a result. 2. Customize packages and solutions. In previous blogs we have highlighted how customizing packages and solutions is a way to combat B2B commoditization and to turn a sales relationship into a trusted advisory relationship. The introduction of organized, full-time solution consultant or sales engineering teams is often a direct consequence of a solution customization strategy. In this case, the emergence of the presales role is an intentional planned decision where the solution consultant is accountable for customizing packages and solutions. The problem in this case tends to be less the scarcity of presales resources – after all the organizations have deliberately decided to add resources for this purpose – than it is the consistent quality of presales team process and performance. Often the first member of a solution consulting team is a rockstar who has already proven his or her value in a presales role. The presales team is built rapidly to accelerate revenue growth with new members of the team coming in with strong technical credentials who undergo extensive product and solution training. Yet the secret sauce that made the rockstar solution consultant successful is rarely based on product and technical knowledge alone. Success is often based on a developed skill set that made the rockstar better than the average geek at understanding the customer and more adept at two way customer dialog that helps to find a solution that fits. The quality of solution consulting becomes directly related to the background and pre-existing skill set of the individual solution consultant unless management takes aggressive steps to build out presales skills and to provide the right tools. Organized skills training for solution consultants is important. A well-defined sales/presales process for the solution consultant or sales engineer becomes a way to get scalable success. One tool that, when adopted, can be a focal point for solution consultant effectiveness is a strong Value Proposition. Value Propositions help presales enter conversations partway through the sales process. Value Propositions facilitate customer-centric conversations instead of techno-centric product monologues. They enable better customer discovery, more successful validation discussions and more effective tailoring of solutions to the specifics of the customer. Value Propositions provide presales professionals with the tool they need to become a trusted advisor. 3. Make custom solutions replicable by “productizing” them. The dream of productizing or scaling a custom solution is often unrealistic in practice. If a custom solution has been paid for and built to customer specifications in a competitive bidding process, where vendors have no initial intellectual property or other proprietary edge, the vendor’s right to apply the solution to other customers may be limited, even if the basic concept has wide applicability. In some circumstances, however, innovative technology, services and data providers bring proprietary technology or information to the party. Sometimes they generate the initial idea for a targeted custom solution. Other times the custom solution evolves out of a collaborative customer discussion. The strategy of finding and/or working with a beta customer willing to pay for the custom solution becomes a way to reduce development risk and cost for a more broadly useful product. Sometimes knowing that part of the solution may be specific to the beta customer, a team enters into custom contract work based on the judgment, or at least the hypothesis, that a meaningful portion of the solution, when delivered to the beta customer, will be broadly applicable and scalable. When productization of custom solutions is a possibility, making the transition from custom solution to product is rarely painless. The team that managed the custom solution’s design and project management somehow needs to either possess or add the capabilities it takes to convert their one-off solution into a replicable product. They need to transform their focus and add the know-how to generate a successful, scalable sales and marketing engine. This works best when the original team’s relationship with and knowledge of their beta customer goes beyond the tunnel vision of concentrated solution development to an understanding of the beta customer’s internal business case and participation in the beta implementation. This experience of successful implementation and business outcomes then becomes central to reconfiguring the product itself to be broadly valuable. It also becomes central to making the business case to other customers, usually by sales reps with minimal knowledge of the customization project. Above all, this takes great product managers drawing on successful beta implementation as they develop the product. Products derived from custom solutions have a strong starting point when they are based on use experience and a Value Proposition realized by a beta customer. That use experience and Value Proposition are immediate, powerful tools that sales can use at product launch. If there is no Value Proposition or content that helps communicate how a new customer will succeed with a productized solution, the team should consider whether they really have a product to launch. 4. Customize content & conversations. The fourth significant trend, toward customized content and conversations, is applicable across the full spectrum of product or solution situations. Customization is sales’ necessary digital response to the greatly enhanced information available to customers in the digital era. B2B buyers require less and later direct interaction with sales reps because they can and do access so much information online. Connecting with customers early in the buying process and countering buyers’ improved ability to commoditize their offering have become ever-increasing sales challenges. The best sales teams respond by understanding their customers better and by tailoring content and their conversations to the customer. This helps them connect faster and differentiate more strongly. Fortunately, making content and conversations specific and tailored to the customer is possible and efficient in ways that would have been wishful thinking twenty years ago. Technology makes it possible for sales to (i) learn more about the customer, (ii) find the best content, and (iii) customize content more efficiently. But the technological shift to customized content and conversations requires different strategies from product management and marketing. Too Much Information (TMI) is the new problem with proliferation of badly organized, digitally available, marketing content never supporting sales effectively. Strategic sales enablement tools are an important solution so that sales can deal with TMI and get to the right content at the right time. But a well-designed content repository is only as good as the quality and nature of the content itself. Company presentations are of limited impact. Product brochures are no longer enough. Sales and presales need the essential content that is focused on specific reasons that a customer should buy and what that is worth. A B2B buying decision invariably involves decision-makers and stakeholders who do the math. They want to know that buying a solution will make money for them and generate ROI. Buyers need to have a business case. 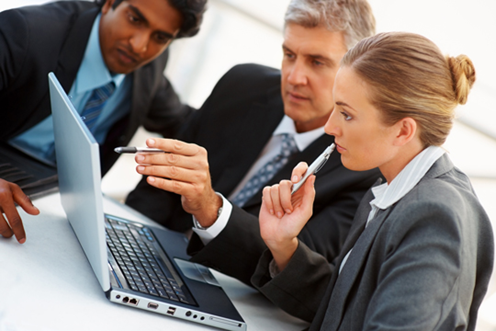 Sales and presales need to collaborate with customers in building that business case. A clear Value Proposition provides sales with the ability to talk value all the way through the sales cycle. Value Propositions are customer-centric. They highlight differentiation. They are customizable as sales and presales continue to learn about the customer through the sales process. They should be a central component of a great sales process as teams customize their content and their solutions to specifics of the situation. In sum, some combination of these four strategic sales trends is a fact of life in virtually all B2B enterprises. The challenges of each trend need to be addressed. Value Propositions are a central part of the solution. A Shared Value Proposition builds organizational collaboration that helps B2B sales teams win. Value Propositions address sales challenges throughout the B2B sales cycle. They are useful early in the sales cycle in call preparation, in building sales confidence, in qualifying opportunities and in engaging customer executives. Value Propositions become an important focal point for a seamless transition to include presales in dialog with an account. Sales and presales teams together use Value Propositions to communicate bottom-line results, highlight differentiation and cut through complexity as they get account commitment to evaluate our solution. In an evaluation phase, Value Propositions are a framework for customer diligence, handling objections and building consensus in conversations with multiple stakeholders. Ultimately, Value Propositions become a basis for building trust and collaboration with customers.